What a joy it is to have a boy! With this bright, stylish arrangement, theyll know just how excited you are about their new arrival. 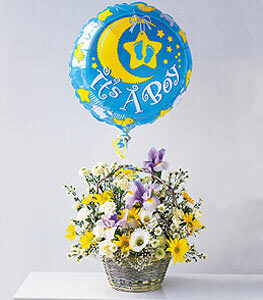 Carnations, chrysanthemums and iris in a darling wicker basket arrive with an attached Its a Boy! foil balloon. This is the first time that I have used your service, but it will definitely not be the last. I will also advise my friends regarding your excellent service.